I have a vine in my garden which produces grapes every year, I believe they are ontario grapes and edible or can be used for jam etc. I’ve read your website and believe these aren’t poisonous, perhaps you can advise. The grapes started to fall off the vine so we picked the rest of them. 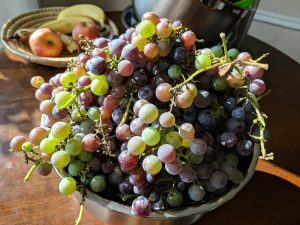 It is difficult to identify exactly the variety of grape you have without more information on the seeds, skin colour & thickness and sugar content etc… You are so lucky to have this bountiful harvest right in your own back yard. That being said, below you will find a link to a previously posed question to the Toronto Master Gardeners regarding Ontario Grape varieties and their care. This should help you along the path to correctly identifying your grapes, but also provide tips on keeping your vine healthy and productive for many years to come.